Is this dual-recording PVR a dependable budget buy? Also available with a 160GB hard disc (as the GHD1621F2), the model tested here has a modest 80GB of storage, capable of fitting in more than 35 hours of TV. It has a relatively slimline case with a plain, silvery fascia and a small dias of controls on the left of the LED readout. The latter displays the name of the selected channel in large green type - useful if you're using it to browse radio channels and don't want to have the TV on at the same time. The rear panel has a UHF loopthrough backed by a modulator for non-Scart equipped TVs, two Scarts (RGB, S-video and composite is supported on the TV Scart and composite and S-video on the VCR) joined by an optical digital audio output and stereo phono outs. The slightly curvy remote won't win any awards for innovation but it sits well in the palm and sports a variably shaped button arrangement that's quite intuitive to use. The software is well-presented and logically organised with plenty of options. Up to five favourite channel lists can be created and there's a full-screen, seven-day EPG displayed as a grid with the channels on the right and a side-scrollable list of programmes on the left. This can be shrunk or expanded to fit more information on screen, and you can skip day-by-day using the coloured remote buttons or jump to a specific channel using the number keys. You can set reminders, schedule recordings and there's a quick search function that can be used to hunt for shows by name and genre, while also letting you specify a time frame for searches and set recordings from the results. Goodmans says the receiver will also be compatible with the Freeview Playback series link option when it becomes available. Recordings can also be instigated by hitting record using the programme information bar or the manual timer with once, daily and weekly options. 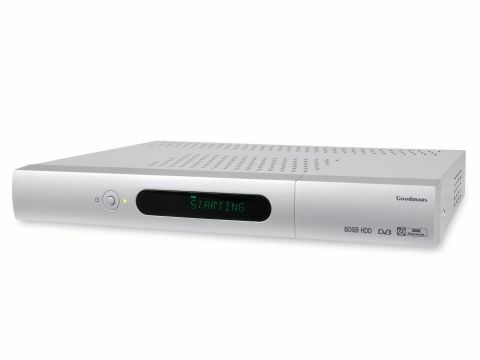 Dual tuners on a Freeview PVR are not always a guarantee of dual recording but, here, you can record two channels at once, timeshift one channel while watching another and also watch a recording from the start while it's still being recorded. The recorder keeps a running cache of what you're watching, allowing you to timeshift on the fly without needing to press pause beforehand. But there's no way of committing what you've been watching to the hard disc retro-actively by hitting record. You can also specify how many hours (and therefore how much disc space) you want to reserve for timeshifting. Recordings are stored in a library with their name, date and channel and the list can be re-sorted in numerous ways. You can PIN-lock recordings and set the PVR to auto-discard the longest, oldest or shortest recording if disc space is limited. Recordings and timeshifted material can be rewound and fast-forwarded at up to 32x normal speed with little noticeable jerkiness or noise dropout. There's also a quarter-screen picture and picture mode for keeping an eye on what's on the other tuner. We had above-average picture results from the digital tuners in our well-served signal area. There was little blockiness in evidence when viewing on our 40in Toshiba LCD TV and recorded footage matched the quality of the source. There are cheaper PVRs on the market with larger hard discs, but few offer the flexibility of dual recording featured here. Nevertheless, avid TV watchers who are not inclined to archive what they watch regularly may want to spend a little more on the 160GB model.